Within a week after we've learned some new tool or technique, sometimes even less, we're back to doing things the old way. It's as if the training never even happened. Why? And what can we do to change this? Management by Design, Reengineering, Management by Wandering Around, TQM, Excellence, Chaos Theory, Balanced Scorecard, Lean and Mean, Management by Objectives, Empowerment, High-Performance Teams, T-Groups, Quality Circles, and on and on. 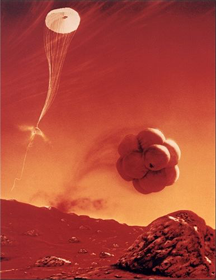 Artist's conception of the Mars Pathfinder landing by bouncing on its airbags. Photo courtesy U.S. National Aeronautics and Space Administration. One change follows another. One training program follows another. And from each training program, we bounce back to the old ways — or something pretty close. We spend big money to bring in a consultant or training company, we spend a day or two or more learning whatever they're teaching, and then weeks, or months, or a year later, all is forgiven and it's back to business as usual. Why does this happen? Here are four causes of this pattern and four strategies for achieving lasting results. When leaders believe in their own credibility, and expect the organization to follow unquestioningly, almost any change is doomed. The most aware among the staff know the futility of embracing enthusiastically anything that will be forgotten within a year. We've been down this path so many times that "management fad" is now a legitimate buzz phrase. Acknowledge the failures of the past and deal with skepticism directly. When we believe change comes from learning a few facts or skills or theories, change efforts tend to consist of training. But if education were change, with all the diet books in print, by now we would all be the perfect weight. Lasting change requires much more than training. One essential item that's usually missing from change efforts is practice. Practice isn't part of training — it's part of doing. We often assume that people choose to stay in Old Status Quo — that if they would just "buy in," all would be well. But culture, policies, procedures, the performance evaluation program, and the actions of others can all cause old behaviors to persist. Plan to transform all organizational components that interact with the change. Recognize that you might have to educate some people even though their actual jobs might not be changing. We often expect the newly trained to use what they've learned, at or above the old level of performance, immediately. Worse, we relax the workflow neither for the training nor the practice. As we learn new ways, we need to practice them. At first, we might even be less effective than when we do things the old way. Relax the flow of work temporarily to allow people to try the new methods in a less pressured environment. Would you like to see your comments posted here? rbrencmOTiqDlEJICbtHBner@ChacqOVgGoAncDhTZPWeoCanyon.comSend me your comments by email, or by Web form. When leaders try to motivate organizational change, they often resort to clever sloganeering. One of the most commonly used slogans is a definition of insanity. Unfortunately, that definition doesn't pass the sanity test. Changing the direction of a group or a company requires passion and professionalism, two attributes often in tension. Here's one possible way to resolve that tension. I offer email and telephone coaching at both corporate and individual rates. Contact Rick for details at rbrennwJeAKvIFfplOhuCner@ChacWMMWcYuiTWpJFzmvoCanyon.com or (650) 787-6475, or toll-free in the continental US at (866) 378-5470.